Think of your favorite peanut butter cup. Now, think about your favorite peanut butter cup if it were made with the best organic dark chocolate and the finest organic peanut butter instead of mediocre ingredients? Add in the fact that the chocolate is also fair-trade, and you’ve got a treat that’s not only packed with delicious flavor, but is good for the planet and the good folks who grow the ingredients, too! Each 1.4 oz. 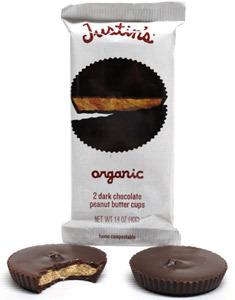 (40g) package contains two decadent and organic peanut butter cups. Gluten-free and kosher. $1.99 per package. This item is still a vegan product, just that the allergen notice is a bit confusing due to it saying "contains milk" (despite there being no milk in the ingredients) rather than "Made on equipement that also processes milk ingredients". From Michelle Farah of Coquitlam, British Columbia on 6/23/2014 . From Eggplant of Vineland, New Jersey on 2/27/2014 . The chocolate and peanut butter in these is perfect! I guess people's tastes are going to vary, or there might be a bad batch now and then? I think they are crazy good! The dark chocolate is rich and smooth and the peanut butter in the ones i had was creamy and perfectly salty/sweet. Please never stop selling them! From Christina M of Denver, Colorado on 12/4/2013 . Being a Colorado based company, I've tried these several times. I do not like the dry peanut butter inside. The chocolate is fine but the dry peanut butter... no way, I will pass?! From Shannon Shamp of Cincinnati, Ohio on 5/16/2013 . I just bought a package of these at my local Kroger. I love that there are so many companies now trying to roll out vegan products but unfortunately cognitive appreciation does nothing for my taste buds. The chocolate in was hard and lacked the smoothness that I've come to expect from decent dark chocolate. The peanut butter portion was ok but bland. And even after being thoroughly chewed the flavors never meshed. Not recommended. Keep on trying Justin! From Anonymous of port orchard, Washington on 3/6/2013 . The dark chocolate was too overwhelming for these peanut butter cups to seem realistic. Not terrible but not what I was looking for. Allergen This item is manufactured in a facility that also processes peanuts, tree nuts, dairy, and soy.